The Flatline compressor is basically a non-inverting amplifier around a opamp. The optocoupler together with the gain resistors determine the total gain of the circuit. The idea of the compressor is to have some gain (typically 20x) when there is no or a soft signal present and to have a unity gain when a large signal is present. So in the guitar attack phase (a large signal) , there is (almost) no gain and in the release phase, the gain increases to 20x while the guitar signal is fading out. This gives the impression of a compressed sound => Less volume dynamics. It also increases the noise level with 20x (=26dB) which is not so nice but inherent to this design. There is a "sustain" pot that is used, as part of the gain resistors, to change the gain difference (=gain ratio) between loud and soft signals. With minimum sustain, the gain ratio is about 3x. With maximum sustain, the gain ratio is about 20x. You can find a lot more information about the circuit on Floris's website. As an option you could replace the 47K resistor with a pot to give you a "Sensitivity" control. The two boards are not identical. The furthest link on the far right side is in a different column. I assume the populated board is correct? God it's annoying when I finish a layout and then decide to move something without doing it on the bare board as well! But it won't make a difference in this case, a link in either position will work. I'll update the layout so thanks for the heads up. No worries. I put this together last night but I'm having a hard time with it. The only sound I can get through it is a severely gated distortion type thing. I tried it with both a LDR/LED and with a VTL5C2. I don't know much about them but from what I gather, the polarity of the LED doesn't matter much, is that right? Actually I've just gone over the schematic and the cap and LED want turning round, so the negative side of both is at the top. I'll update the layout. Great! I didn't see the "-" attached to the LED. I'll make these changes tonight and see where that gets me! Thanks for everything you do here! Built it. Although only LDR i had was the one that tayda sells - with no decent specs. Tried it with red, yellow and clear leds, and no. That LDR works best if i put my finger on it. So it's really a no go LDR. Circuit seems to work right. Verified? Layout surely seems like it, but without properly working/specified LDR, i can't say what it sounds like. I have VTL5C1s, but those are also no good. To clarify, i got compressed sound out of this, but it affected the signal so little, that i'll rather try better LDR than leave it like it is. Oh well. I'm waiting for like 5 packages from around the world, so i'm not ordering any components soon. If anyone has an insight what LDR and led to use, i'd be grateful. Not sure if 10K is a bit high, but you could always change the value of the 220K in parallel with it to compensate. Tayda's seem to be KE-10720, which is 10-20K to 500K - which would explain the mild effect. Then the math and waitrony KE-10720.. 500K + 220K = ~152K / 10K + 220K = ~9K6. So the resistance with that LDR varies between 152K and 9K6. While this seems to work, it's not close enough. 1K to 1M is much wider scale with from ~99R to ~180K. To use this LDR to successfully match the light resistance, one would need to change that 220K to 1K8. To match the dark resistance, it would be ~270K. 1K8 would make this a distortion, and 270 would compress it way too little. 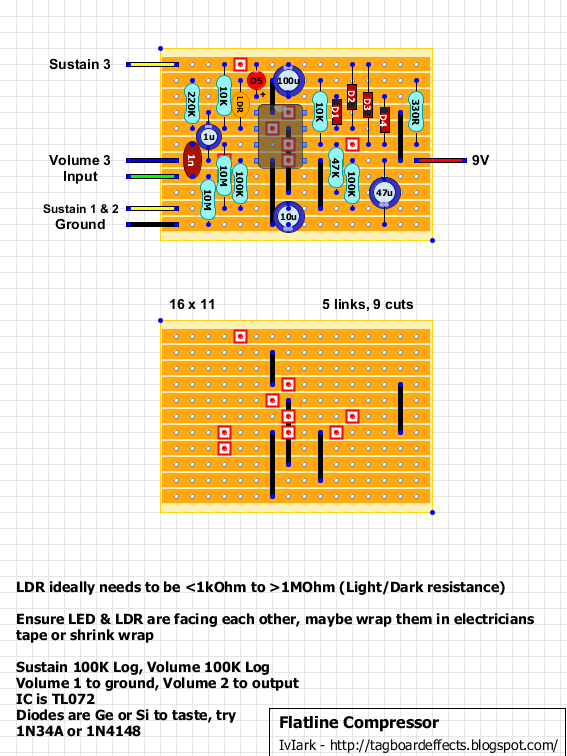 It could work with 150K (or 120K) resistor. 150K gives less than 10K for light resistance and 115K for dark resistance. I guess that would be a little subtle, but i could work. I'll try it out and let you know. Yes it would always need to be some sort of compromise between the light and dark resistance. I've got a few Silonex NSL32's which may do the job. I've also got a VTL5C2 and VTL5C4 stashed somewhere but had those earmarked for something else. Yeh. Now i can say "Tag it". I tweaked it a lot, but it works and with my mods it's decent compressor. Not as good as Orange or Squishy - But that's because of the LDR used is not capable of right resistance. It really needs that 1K light resistance before it can be called a clone. Anyway. I swapped that 220K with 150K and it worked much better with clear led and that waitrony LDR. I could have stopped there, but i didn't like the sustain control. So i swapped the pot for B50K and the 10K resistor for 75K (68K would have been better though). What that did is it changed the location and the lenght of the sweep and gave it a bit more resistance to begin with. Meaning that it cleaned the slight distortion i got from it when sustain pot was maxed. I'll keep this like it is, but once i get a hold of suitable LDR, i'll probably build it all over again. Brill, cheers mate. 9 to go! I built this layout with a VTL5C3. It works but only so well. Depending on my guitar's volume knob, if I turn the volume or sustain on the pedal up beyond 2 o'clock or so I start to get chirping oscillation. If I play into it the chirping goes away, but as the compressor starts to kick in on the decay of the strings the chirping comes back. The chirp is kind of a "whooop... whoop...." sound. Very strange. 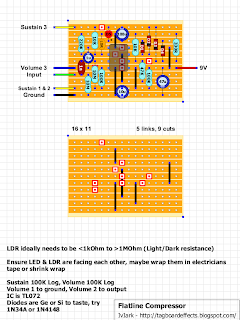 I'm going to try the original schematic cap values and resistor values around the sustain pot to see if that fixes the problem, but is there something else I could be looking for? The VTL5C3 has much higher overall values than a VTL52C, dark resistance is 10Mohm, light is more like 55k depending on input amperage. Not sure with a 9v battery what it is. But it seems like at the dark resistance it's over-amplifing the quiet signal causing a kind of oscillation. Any idea how I would that? I'm thinking i'll build this later in the month. thanks for posting a Vactrol that works! and nice board by the way, Very clean! Those Chubby flat caps are awesome! Hi guys, is there anyway to change the attac speed? The minus (-) of the output cap must be to volume 3. "As an option you could replace the 47K resistor with a pot to give you a "Sensitivity" control." Hello, if i replace the resistor by a pot, how should i wire the pot lugs (a resistor features 2 wires, a pot has 3 lugs) ? I successfully built the Flatline today, using a ready-made vactrol as advised. Overall, it is a nice, clean compressor. I recommend adding a sensitivity knob. Thank you for the layout, Iviark !